PRESS RELEASE: NCW presents the Friday Night Fights! Last month at COLLISION COURSE, NCW kicked off the 2014 season with a bang. All three champions successfully defended their titles, including new NCW Heavyweight Champion “RIOT” Kellan Thomas, NCW Tag Team Champions Back to the Fuzion, and NCW New England Champion Rob “The Giant” Araujo. Already announced for Friday Night April 11th, the reigning NCW Heavyweight Champion “RIOT” Kellan Thomas defends his title against “The Masshole” Mike McCarthy in the night’s main event. McCarthy. a former NCW New England Champion had some incredible matches with Thomas last year during the 2013 Season, and looks to use his knowledge of “RIOT’s” move set to become the new NCW Heavyweight Champion. 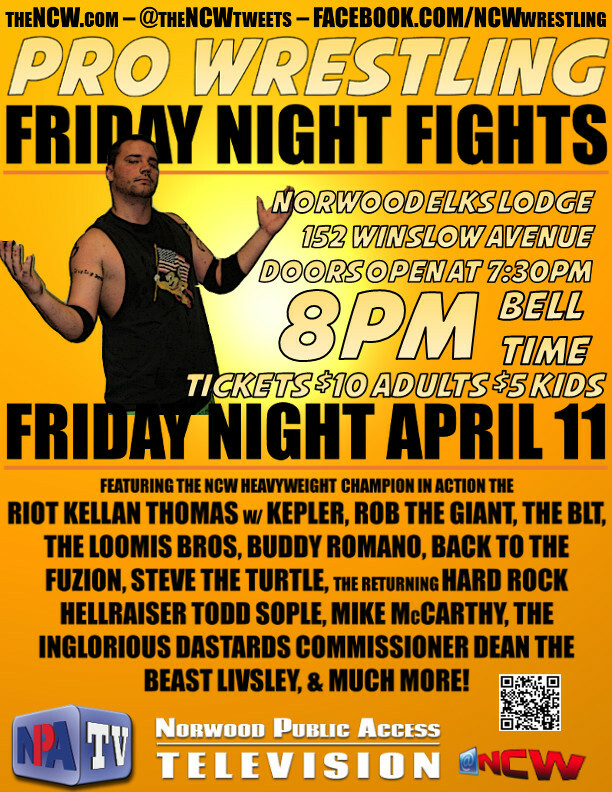 Also scheduled to appear at the Friday Night Fights: NCW New England Champion Rob “The Giant” Arajuo, Current NCW Tag Team Champions Mike Paiva and “All Good” Anthony Greene: Back to the Fuzion, NCW Commissioner Dean “The Beast” Livsley, Davey and Eddie: The Loomis Bros, Steve “The Turtle” Weiner, NCW 2013 Rookie of the Year Tomahawk, Buddy Romano, the Lumberjake and Ruy Batello: The Big Loveable Team, former NCW Tag Team Champions The Inglorious Dastards, Triplelicious, Todd Sople, Rocco Abruzzi, “The One Man Mosh Pit” Tim Lennox, “Magic” Sean Feeney, Dominic Delano, and NCW Deputy Commissioner Richard Pacifico. 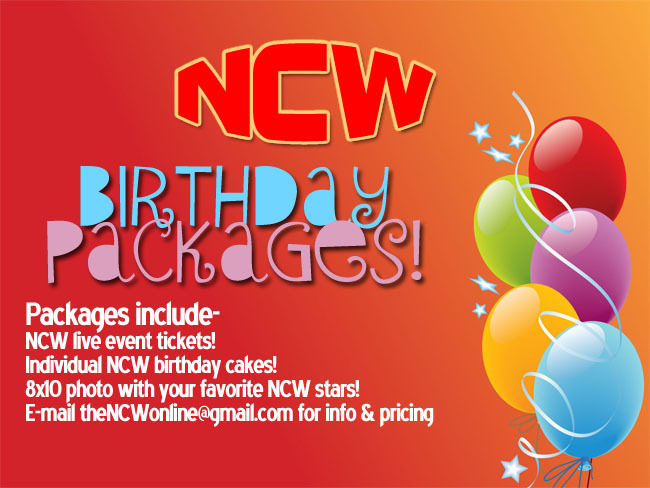 Competing in a seasonal format NCW presents a unique showcase for fans of professional wrestling, bringing forth our larger than life characters, dynamic storylines, and incredible athleticism, while providing a thrilling experience for fans of all ages. The Norwood Elks Lodge is located at 152 Winslow Avenue in Norwood, Massachusetts, just moments away from the Norwood Town Center. Doors open at 7:30 with an 8pm bell time. Tickets will be available at the door $10 for adults $5 for kids. Bar for 21+ with a valid ID. For more information on Northeast Championship Wrestling please visit theNCW.com. Don’t forget to follow us on Twitter @theNCWtweets! 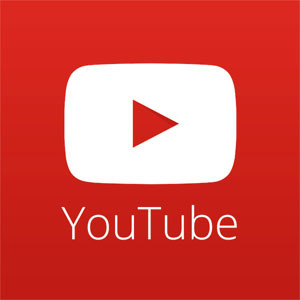 Catch NCW on Norwood Public Access TV! As always Card subject to change. Previous PostCourse Completed: NCW COLLISION COURSE ResultsNext PostNCW’s Friday Night Fight Results!